An unexpected text message after the conclusion of his junior hockey career led to Daylin Smallchild fulfilling a childhood dream. Like most other youngsters who play hockey, Smallchild, a member of the Beardy’s First Nation in Saskatchewan, aspired to eventually play the sport professionally. The 21-year-old Cree defenceman has accomplished this feat. He spent the 2018-19 campaign with Mad Dogs Mannheim, a pro club that competes in Germany’s DL4, the fourth highest level of hockey in the European country. A year ago, after using up his junior eligibility with the Manitoba Junior Hockey League’s Swan Valley Stampeders, Smallchild was unsure of his next move. “The head coach for Swan Valley kept telling me to have a plan by the end of the season,” Smallchild said. But didn’t. He said he was simply a 20-year-old focused on his last year in the junior ranks and didn’t put much thought into his future. Shortly after the season with the Stampeders concluded, Smallchild received a message from Nathan Johnson, who runs the Sharp Edge Sports Management agency. Johnson, who is based in Dauphin, Man., specializes in finding European gigs for pro hockey players and told Smallchild he could secure him an overseas deal. Sure enough, Johnson sent Smallchild a contract to sign from another DL4 club last spring. Johnson secured another offer for Smallchild later on in the summer. He inked a one-year contract with the Mad Dogs this past August. Johnson was one of two imports (Canadians) on the Mannheim roster. The rest of the Mad Dogs’ lineup was comprised of German-born players. “It’s definitely a higher step up than junior,” Smallchild said of the DL4 circuit. Smallchild refused to disclose his salary for the season, but he said the club also paid for his living expenses for the year. Smallchild ended up being one of the Mad Dogs’ top performers. He was the top scoring blueliner for the squad, picking up 22 points (nine goals and 13 assists) in 24 regular season contests. But the Mannheim squad finished in seventh place in its eight-team division and failed to qualify for the playoffs. The top four finishers in the division advanced to post-season action. Mannheim’s final game of the season was on Feb. 22. But Smallchild is staying an extra month in Germany before flying home on March 20. He’s currently training with the Mad Dogs’ reserve team. And he’ll also suit up for two games with that club, this Friday and on March 16, before he returns to Canada. Smallchild is hoping to return to Germany for the 2019-20 campaign. He’s currently in negotiations with the Mad Dogs to sign another contract. But he also believes he can move up a level to the DL3 ranks and possibly even higher as early as next year. Though he didn’t see any DL3 matches this season, Smallchild did attend a DL2 game. He also caught a contest in the DL, Germany’s top pro league. He’s confident he could toil in a higher circuit next season. When he returns home, Smallchild plans to have his off-ice workouts at a gym on his First Nation. And he will travel to Saskatoon, about a 40-minute drive from his home, for his on-ice training sessions. One disadvantage of playing so far away from home is that Smallchild’s parents, Deanna and Robert, were not able to attend any of his Mannheim games in person. “They’ve been watching it on the live stream,” Smallchild said. But it’s not just his parents that are proud of him. Prior to turning pro Smallchild spent two seasons with the Stampeders. 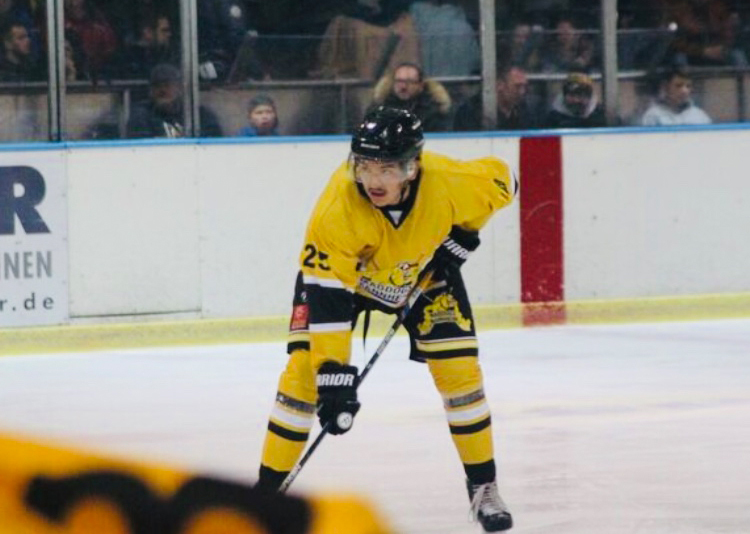 During the 2017-18 season he had 31 points, including five goals in 60 regular season games with the Swan Valley squad. Smallchild had started his junior career with the Onion Lake Border Chiefs, He spent the 2015-16 season with the Border Chiefs, a Saskatchewan-based team that competes in the North Eastern Alberta Junior B Hockey League.